Both Smith machines were occupied when I started my leg workout and the leg press sled in the back was broken. I decided I would start with the Cybex leg press machine. The full stack of weights is “only” 350 pounds, a weight I can press on a leg sled rather easily. However the work effort required to push the same weight on the Cybex set up is considerably higher. To achieve this difficulty you need to adjust your starting position accordingly so that your knees have a deep bend in them at the start. I see many people do this machine where their starting knee angle is 45 degrees or less, which makes the movement a ton easier. When I topped out with 6 reps at 310 pounds I was feeling a total lower body exertion that told me I was getting some solid work done. 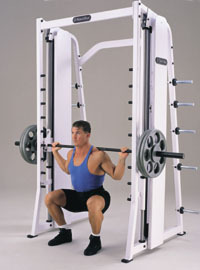 I did eventually get some sets in on the Smith machine in the middle of my leg workout. Doing it in a somewhat pre-fatigued state made the three sets of 10 reps with one 45 on each side feel quite challenging. I am literally bottoming out my range of motion on the down portion of the movement. It seems impossible that that extra 6-8 inches of depth translates into so much additional difficulty going back up but it does. It might not look impressive to onlookers but I again I can feel that I am challenging my body to use muscles in positions they are not used to working from, meaning I am getting constructive reps in.